Abuja Resident Entertainers. are putting up a Concert on the 22nd of march 2015 . 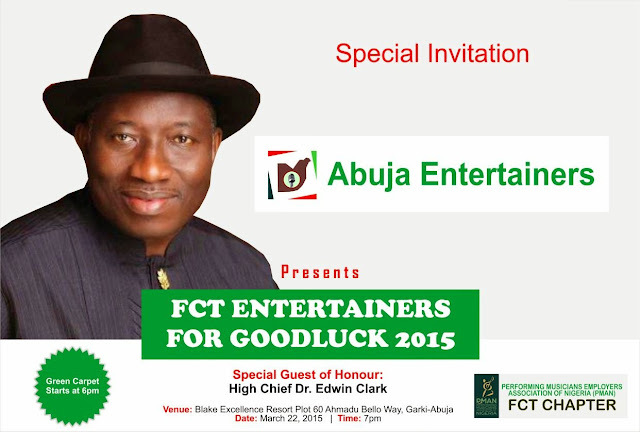 With The Theme" Entertainment and the Transformation Agenda"....Special Guest....... High Chief Dr Edwin Clark OFR. CON The concert is aimed at showing solidarity. and endorsing the president GoodLuck Jonathan for continuity and transformation . All Musicians, Comedians , Actors, Producers , Dancers , Radio. And Tv personnels , promoters etc....are all coming out to give their 100% support . Green Carpert starts by 5 30 pm.